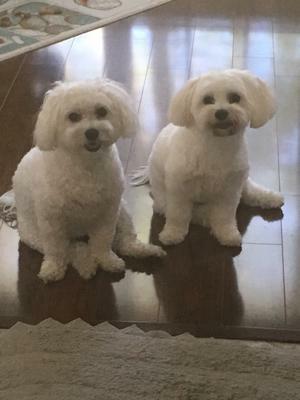 Hi Buffy and Buddy are very patient as I get ready for our evening walk. They love riding together in their jogger stroller . The stroller is the best purchase I made in a long time. My babies start telling me at 6:30 it's time to go. I pull it up along side the coach and they eagerly jump into it. The best part of our walk is I get my exercise and have two special companions to talk with. The babies walk during the day for their exercise. At times one might want out to go potty. Buddy is the one who barks at me until I take him for his ride. It actually is very good for me cause they make me take them everyday. 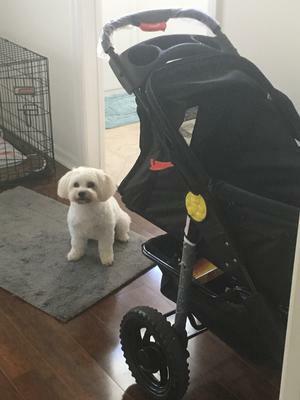 The stroller is made by Pet Zone $135.00. It is single but long enough for the two and they do sit side by side. Strollers are good for taking them to stores in vice the shopping cart. Too cute. Do they get to walk with Mommy too? They are precious! I am wanting to get a jogger stroller for Bill. What brand is yours?